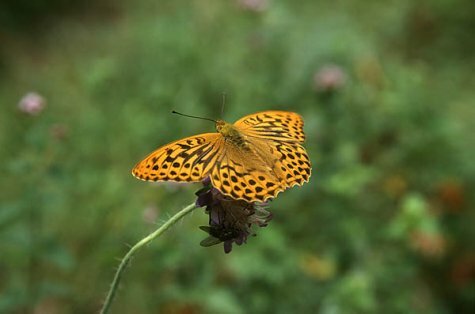 They are large butterflies with a characteristic fast and gliding flight; once you have learnt to identified them they are recognisable from far away. 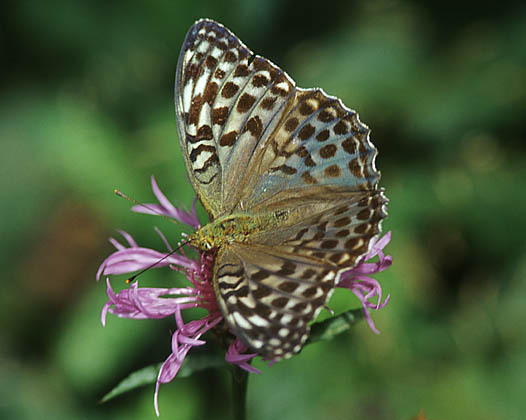 The underside of the wings should be noted – it is greenish yellow, with silvery bands. The females are a little larger than the males. The forewings of the fritillaries are triangular, the hind wings large and rounded. Basic colour is orange, patterned with contrasting dark patches. Mostly encountered in forested areas and on clearings. Good observation points are the verges of forest roads or felled paths. The fact that the females occur in two colour forms may be a little confusing. 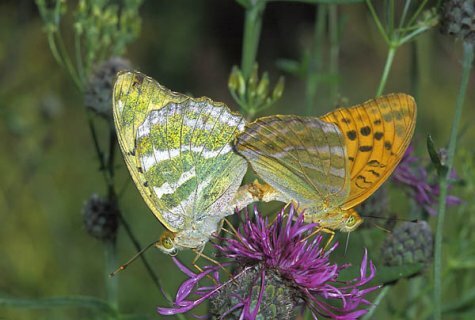 They are either similar to the males (see above) or have the quite widely spread greenish grey colour (Argynnis paphia f. valesina). Identification in these cases is helped by observing the flight pattern and the shape of the wings.